When we were barely married, Husband and I tested our marriage by borrowing a tent to road trip from Ohio to North Dakota for a family reunion. Some of my family felt sorry for us because we chose to camp. What they didn’t realize, that while camping allowed us to make the trip after attending five weddings that year (and throw our own,) we used my childhood RV camping experience and Husband’s foodie skills to cook amazing meals and eat very, very well. I love my Wonderbag non electric slow cooker because I can use it to slow cook any recipe I make at home. It doesn't matter if we have electric hookup or not. Slow cookers give the camp cook more time to play! I cook in my Wonderbag even when I'm not camping. Love. It. Solar ovens are another power free slow cook option if you camp in where there is enough sun to heat the oven. I don't have a solar oven since I have a Wonderbag. I have friends who love their solar oven and swear by the All American Sun Oven. I like this guy because I can hang it over a fire to cook chili and use it as a traditional Dutch oven in a fire with coals on top of the lid. Sometimes RV kitchens make the camper unbearably hot. Taking your cooking out side on a camp stove is an easy and tasty solution. There are basic two burner camping stoves and just about any type from basic to whiz bang doodads to fit whatever needs you have. Since we tent camp with a small car We have a CADAC Safari Chef Lightweight Gas BBQ because it packs small and comes with several cooking surfaces - grill, griddle, wok, and dome. We make a lot of stir fry at home and use the wok to make it on the road too. If you want to get REALLY fancy consider the Camp Chef Camping Outdoor Oven with 2 Burner Camping Stove. This bad boy features not only a range cook top but also an internal oven! It cooks for up to 5 hours on high heat with one 1-pound can of propane. Sweet! Husband and I refuse to drink bad coffee even while mucking about in the woods. There are stove top camping percolators but I do not recommend them. Percolators are the absolute worst way to make coffee. Percolators boil the grounds and makes your coffee taste bitter. Bleach! If you have access to electricity you can easily grab your coffeemaker from your kitchen and plug it into your camper kitchen. Done. When tent camping, Husband and I heat water in a teakettle similar to this Camping Blue Enamel Tea Kettle and make coffee in a French press leftover from my single days. If you don’t want to chance a glass French press carafe breaking in transient (because you are smarter about that than we are) try the Thermos Vacuum Insulated Stainless-Steel Gourmet Coffee Press, It is made of unbreakable stainless steel. If I ever break my current French press, I'm going to upgrade to this one. If you don’t want to go with a French Press, the Coleman camping coffee maker is made to work on a camp stove. You might be able to use it on a propane stove in a camper kitchen too. I'd check on that first though. You can use it to make coffee on regular car road trips too. Coleman Packaway Deluxe Camp Kitchen It is nice to have a work surface for peeling chopping washing, rinsing, and cooking separate from your picnic table. The lid closes to keep animals from using your work surfaces as a potty spot. The lower area on the right is large enough for a two burner camp stove. Pie Irons – you can use them to make breakfast, hot sandwiches, dessert pies and more. I recommend the square irons because they don’t waste bread like round irons. Check out Rome's Creative Pie Iron Cooking Book for yummy pie iron recipes. Hot dog or marshmallow roasting sticks You already know about those. Did you know you can use them to cook other things too? 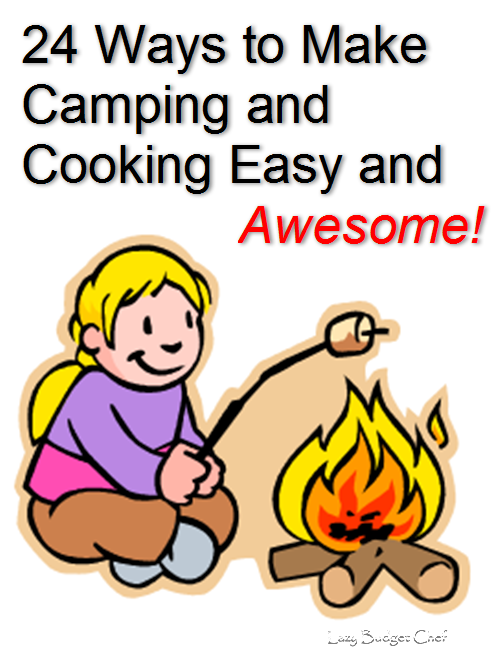 I didn't until I read Cooking On A Stick: Campfire Recipes for Kids. YUM! Coleman Popcorn Popper – You haven’t lived until you've eaten popcorn cooked over a campfire. This style is my Dad's weapon of choice when he made popcorn for us around the campfire. If you enjoy grilling over a campfire, I suggest the Adjust-A-Grill Portable Campfire Grill because you can add or remove food by moving the grill from over the fire instead of standing directly over the campfire grill which can be dangerous. Unlike thin backyard grills this one is made to stand up to campfire heat. ...the Texsport Campfire Tripod if your campground does not allow you to pound stakes or make holes in your campsite. The type of grill you choose largely depends on the room you have to transport it and preference. If you are cooking over an open fire or grill, you will need something more than substantial than a traditional pot holder to protect you from burns. The heavy leather Campfire Fire Place Tender Gloves will do just that. These gloves are excellent for backyard fire pits and grilling too! Campfire, grill, and propane stove cooking temperatures can fluctuate and often have different quirks than the appliances in your home kitchen. A good meat thermometer like the Taylor Classic Instant Read Pocket Thermometer is a double check for the above. Sure, there are digital and battery powered meat thermometers. I have one in my kitchen too. I bypass mine and go with the Classic when we are away from home because the batteries don't die when it is time for me to use it. And speaking of food storage and temperature, pop a refrigerator thermometer like the Taylor Food Service Classic Series Freezer-Refrigerator Thermometer in your food cooler and/or RV refrigerator and freezer to make sure everything is at a safe to eat temperature, especially if your RV’s power goes out (it can happen) or you misjudge when you need to add more ice to a cooler. I like the Taylor because it has the food safe temperatures marked and won’t rust in a wet cooler because it is stainless steel. in the refrigerator in our cooler before a trip. What are your camping must haves?